Ritz Bits are VILE. . . Since I'm always going on and on about roast chicken, I figure we'd do a roast chicken post to show how easy it is to do a roast chicken. 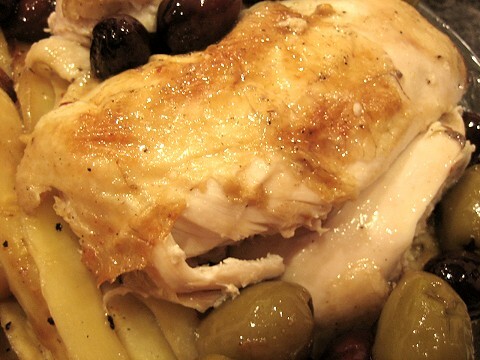 Roast chicken is one of my favourite all-time meals. I like the fact that it's infintely versatile: you can flavour it however you want and it still ends up a delicious chicken-y goodness. One of my favourites is the classic rosemary-garlic-lemon combination. My mouth is watering just thinking about it. Lemon-thyme, lemon-oregano, sage-butter. . .the list goes on. I've done one before with an orange-curry-allspice rub and that was also quite yummy. For a more Asian twist, I've done it with soy sauce, lime, cilantro, and lemongrass. I think I served that chicken with a bowl of homemade pho. I could go on and on and on and on about roast chicken. I like the fact that it is very easy to do and easy to pull out for a main dish or a supplemental dish for those times you have more people coming over dinner and one main is not enough. 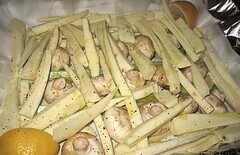 I've never tried cooking parsnips before but I like the name "parsnip." Seems very English, with its nippy ending. It looks like a white carrot and I thought that it would taste like a creamier carrot. When I roast chicken, I usually don't bother with a bed of vegetables. 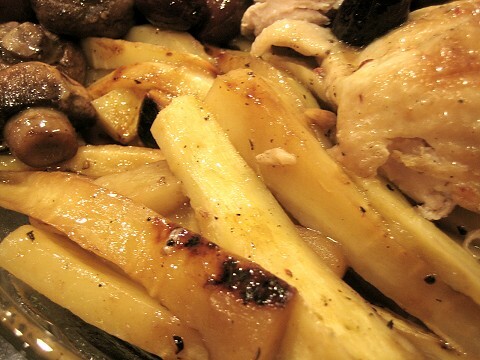 Since I have parsnips today, I thought I'd try the parsnips and the bed under the chicken. 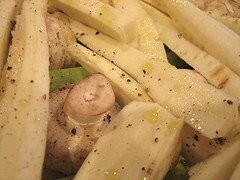 We put celery, mushrooms, and the parsnips under the chicken. Oh and olives. As for the measurements, the reason we put the amount of each ingredient is because that's what we had. ...and drizzled some olive oil and squeezed a couple of lemons. Salt & pepper too, of course. We rubbed the chicken with some lemon juice and olive oil as well and seasoned it with salt & pepper (both sides and inside). Since we had some leftover olives that have been sitting around in the fridge, we decided to dump those in as well. And oh, we just left the squeezed lemon halves in the pan as well. 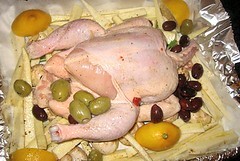 In the oven, 350F to 400F. This chicken took about 50 minutes. The mushrooms were so nice. The parsnips too! They had a subtle hint of sweetness, almost like a banana... Well, perhaps 1/100 of its taste was the hint of banana. It was VERY good! I gobbled most of it, I think! 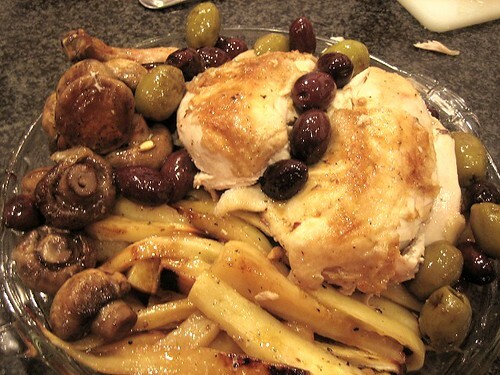 The juices from the chicken and all the vegetables blended together nicely, and brininess from the olives worked to brighten the "rich" flavor of the chicken juices and vegetables. I am trying this tonight ... it looks incredible. If it tastes as good as your photography makes it look, its a home run. Thanks for the post and thanks for the wonderful photos. Tried this, but used carrots instead of celery for flavor & color. It was absolutely fantastic!! 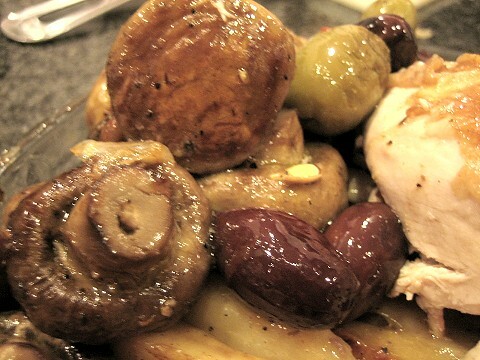 Combination of lemon, olives, veggies, and chicken won high accolades from visiting in-laws, always a good thing. Got mixture of various olives from a bulk olive-bar display at high-end supermarket. 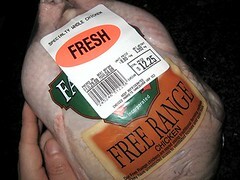 Also: use a top quality chicken, which yields less fat, more meat, and better overall flavor.